Zebra Dove | Flickr - Photo Sharing! 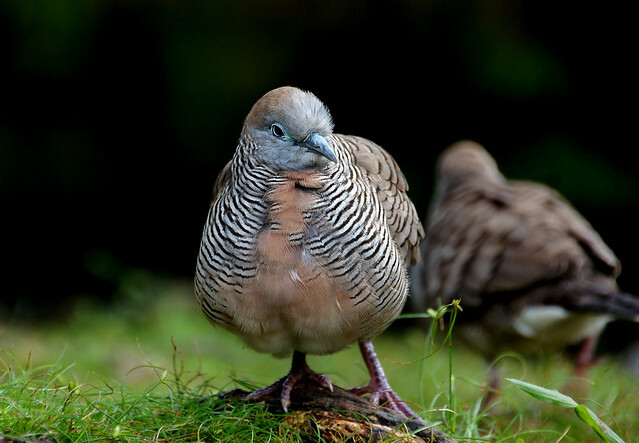 Native to Southeast Asia, the zebra dove came to Hawaii from Australia in 1922. It is difficult to pin down with accuracy the exact reason why, but the introduction of the zebra dove probably occurred because there was a market for game birds on the islands at that time. This bird is common throughout the Hawaiian Islands and Oahu is no exception. A person can see them when walking along Waikiki beach or exploring a garden. They are also a common visitor to food courts and in some areas, they are so comfortable around people they will fly up into one's hand and eat from it if a person holds still. They do love the lowland areas, so it is a bit unreasonable to expect to spot these small doves in the mountains, but they are equally common in both rural and urban areas of the island. woodpigeon23, Lesley A Butler, and 27 other people added this photo to their favorites. A beautiful dove, great capture! lindos estes passaros,tem umas cores do outro mundo!!! Excellent capture, colors and details! What a cool looking bird!